The film is full of emotional contradictions, and trades in them to keep this simple tale of "one last job" from falling into cliché in the wrong ways. About midway through The Town, there's a quiet pause, just a calm moment before we dive into the film's next dramatic movement, as happens so often throughout. But I laugh, because it's the prelude to a car chase through the winding, claustrophobic streets of Boston's North End. But I am not asked to suspend disbelief for the benefit of this car chase; instead, director/co-writer Ben Affleck (Gone Baby Gone, Good Will Hunting) delights in the absurdity of a chase on those streets, packing the ensuing scenes with tight turns, swipes along buildings and parked lines of cars, and hold-ups at intersections. Doug MacRay (Affleck) and his team get away from the cops by simply jamming up a street with a single SUV. It's that sort of attention to detail, layered on top of an elegantly simple story, that makes The Town a delight to watch. The film is full of emotional contradictions, and trades in them to keep this simple tale of "one last job" from falling into cliché in the wrong ways. Doug and James (Jeremy Renner, The Hurt Locker, M:I Ghost Protocol) walk down the block to beat up a couple guys as a warning, like it's the most ordinary day-to-day thing. We're supposed to be impressed by Doug's cool in the face of police interrogation, but are mostly impressed by Gloansy's (Slaine, Gone Baby Gone) aim to be "authenticious" and fed Dino's (Titus Welliver, The Good Wife) confounded exasperation in response, in one of several small gems of scenes. Doug and erstwhile hostage Claire (Rebecca Hall, Vicky Cristina Barcelona, The Prestige) fall in love as they charm one another with tales of personal tragedy, and Claire, of course, is reminded of death on sunny days. It's best, though, not to think of The Town as a heist movie. Some of the moral dissonance is quite stark, especially when James recklessly mows down a few cops or security guards. And the notion of an unobserved daylight armed bank robbery in the heart of Harvard Square is utterly absurd. Instead, it's a simple tale of people screwing up and trying to do better next time, maybe, if they get the chance. Things reach denouement for everyone involved, though no one is entirely undamaged by the outcome. And you get the feeling that, if they could do it over again, they would screw up in exactly the same way; at one point late in the movie, Doug's FBI rival Adam (Jon Hamm, Mad Men) can feel that Krista (Blake Lively, Gossip Girl) is ready to betray Doug. He seems to offer her a happy ending. I know he's lying, he knows he's lying, and surely she must know he's lying. I'm not sure he really wants to help her, but could he, even if he wanted to? And can she really refuse, even though it's nothing more than fantasy? Special features: This rerelease includes an alternate ending. Alternate endings must always be judged in the context of the original ending; after all, there must be a reason for the original choice. The alternate ending, without giving anything away, seems to reclaim some of the moral ground lost to dissonance as I previously wrote. But that's not a strength; it seems to distract from the more character-oriented interpretation of the film I favor. If you must have gritty endings to your crime films, though, by all means partake. Perhaps, though, you'll better enjoy the extended cut, also included. 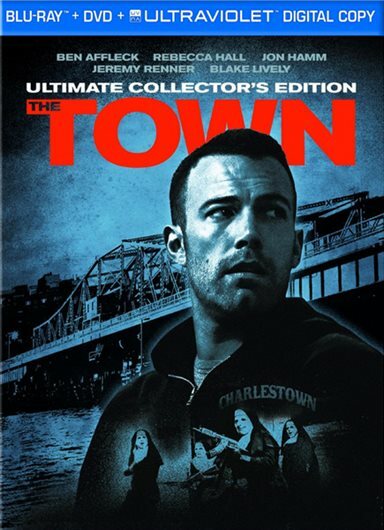 Download The Town Ultimate Collectors Edition from the iTunes Store in Digial HD. For more information about The Town visit the FlickDirect Movie Database.